Harkness Screens Launch New 3D BIM Content Library to Support Improved Cinema Design And Construction. Las Vegas, Nevada (March 29, 2017) – Harkness Screens the world’s leading screen technology company has announced the launch of its 3D BIM (Building Information Modelling) content library aimed at helping architects and those involved with cinema design improve the outcome of their digital modelling projects. 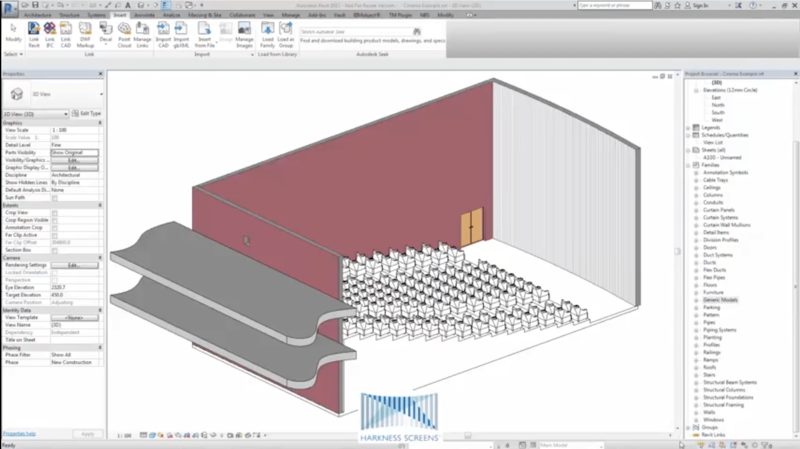 This new content has been developed to support those designing cinemas using Autodesk’s Revit platform, the world’s leading 3D BIM platform. “The pace of technological change in the construction industry has been very similar to that which the cinema industry undertook when converting from 35mm to digital projection. Over the past ten years, the wider construction industry outside of cinema has moved from designing in 2D CAD to a significantly more collaborative, dynamic and data-rich 3D environment,” says Richard Mitchell, VP Global Marketing and Commercial Development at Harkness Screens. “This change has helped project teams deliver better outcomes for their clients through improved project planning, reduced risk, smarter project coordination and increased levels of information which enable the client to manage their asset (a building) more efficiently. A key component to providing clients with a rich level of information about their building is relevant content from product manufacturers.” he adds. The new Harkness Screens BIM content library covers the company’s complete portfolio of cinema screen products (including Perlux, Clarus XC and Spectral) and allows cinema designers to size screens based on common screen formats or custom sizes and then use innovative technology to analyse the impact on potential viewing experiences based on auditorium and screen design within the BIM model. In addition the content library also feature the company’s screen packaging which allows design teams to identify potential on-site clashes that may occur when transporting screens into the auditorium and plan construction sequences accordingly to mitigate on-site delays or costly errors. “This latest addition from Harkness further extends our commitment to helping enrich every cinema experience by providing innovative solutions to support architects, exhibitors and integrators in improving design, specification, install and use of cinema screens and their ongoing maintenance,” explains Richard Mitchell. The new Harkness BIM library is now available via the Harkness website – www.harkness-screens.com.